I use this app all the time but in the last month it hasn’t been showing the radar anymore. It also crashes randomly. I love this app and rely on it and would love to see it fixed! I use it every time out. Love the forecast feature. This is the best wind forecast program out there! Beats any of them out there. As far as wind direction and speeds it's right on beats noaa forecasts every time. I race on Lake Ontario and find SailFlow very helpful in predicting air temperature and windspeed and direction. A great tool! Great details on winds information for all sailors including gusts. Must have! We sail the North West have have grown to depend on this APP. A must have! I sail in the same place twice a week. Every time I open the app, I’m greeted with “invalid search “. Then I see the last location at the top of the screen and it won’t let me select it. So I type that into the search bar and it finds that location. I tap the star to add to favorites, but the next time I open the app, no favorites are found. Pretty worthless, imo. Besides, the forecast isn’t usually close to reality. Love knowing exactly what the wind is doing! Simply the best weather for boating app available. Really good at forecasting conditions for very specific locations. Worth paying a bit extra for the “plus”version, as it is slightly but consistently more accurate than the free forecast. Great App! Accurate and extremely helpful. Not guise as easy to use as the web page, but very helpful for short term predicts while on the water. We sailors at the Chautauqua Institution utilize this app daily and find it to be an accurate and very useful tool for both racing and cruising on our Lake. Thank you very much for making it available!! An accurate and useful tool that's great for near term planning. Use caution though... The computer driven model won't tell you there's a hurricane coming! Be sure to check the marine forecast as well. App crashes every time I open, has been doing this for over a year, update after update. Not sure I’ve ever been able to retrieve a forecast or use any function of the app at all. 1 star because I have to. Will not recommend to even my worst enemy. Just started using it and really like it so far. Do not sail without SailFlow! Everyone at my YC swears by sailflow! 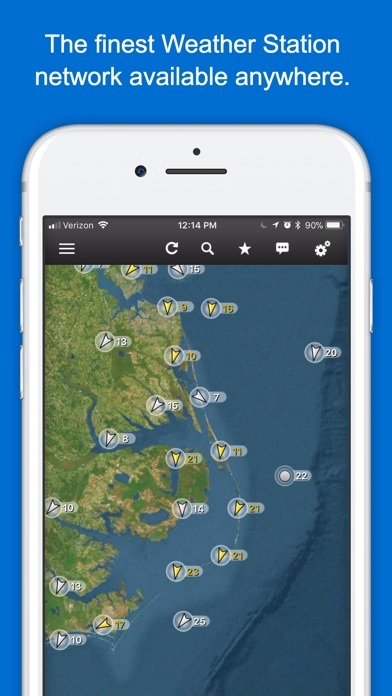 No other app offers such incredibly high quality weather stations, and forecasts. I use this app all the time with no problems. We used it to travel the ICW Atlantic this fall and it was our guide to our travel plans each day. Only reason I am giving it 4 stars is that on my iPhone (iPhone 6s) it displays the map and locations making it easy to use. When my husband loads the app on his iPhone 8 we cannot get the map to appear, even though we compared all our settings to ensure we were the same. He has the latest iOS loaded so not sure if it is an issue with the iPhone 8? Would highly recommend this easy to use app and hope to get it working on the iPhone 8 with a Street / Wind map like it does on my iPhone 6s. Super site with detail I use to manage regattas and for my sailboat racing. Well put together information and pretty accurate, before heading out on the big water I check it. Gives me everything I need to know weather wise. 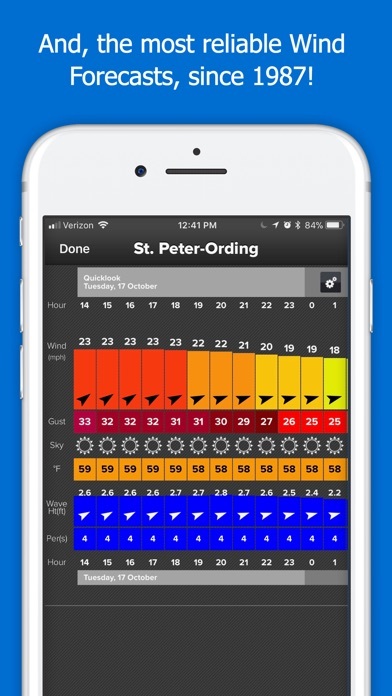 I’m a fishing Guide and depend on SailFlow for wind predictions and find it very accurate. I like the availability of sites in the regions I fish. They update enough to keep app working well. This app gives precise and unique info for guys like me that race sailboats where wind, waves and weather in general matter. Seeing all history, current and forecast weather is important for both safety and more so to be able to anticipate changes that give me an edge in competition! Thanks guys and gals. I was wedded to WindGuru for sailing on Chesapeake and Biscayne Bays, but that app went south. SailFlow is far, far better, more informative and a snap to use. VERY GOOD IN GENERAL With detailed forecasts on everything from sky clarity and temperature to wave height. But it tends to overestimate wind speeds in its forecasts. I’ve used Sailflow to plan racing on inland lakes to beer cans to major offshore for as far back as I can remember. It is a consistent aid to my performance. Almost always makes me look better than I deserve. Free version okay, don’t pay for upgrade! Had exactly same thing happen and it locked up asking me to upgrade to Pro. Won’t let me in on free version. Don’t use enough to warrant fee for extras. Was good the way it was. I cannot live without Sailflow. Don’t make yourself live without Sailflow! :) Also, the Wind List is a great quick way of viewing the weather stations. Even when I pay the forecast area is reduced by an ad. That is a new anti feature. Absolutely terrible change. Limits viewing of the full forecast to one day at a time. What a bunch of Wankers!!!!! SailFlow shows current wind speeds in my sailing waters, on the north SF Bay. There’s a lot of variation from location to location on the bay, so I can plan to find conditions that suit my solo sailing on most days. I use the app constantly. Sailflow is indispensable * The best app on my phone. Thanks guys, now I’m going sailing. Only outfit to have their own weather stations! Easy to use, best data where they have weather stations. I used this app throughout the sailing season on Long Island Sound this past summer. It was a fair predictor of the fluky winds we have on the Sound late summer and fall. I find the app to be easily accessed and not difficult to navigate through the layers. Work on Port Jeff Harbor with Murphy’s Port Jeff Launch service. The wind graph gives me a great picture of what I will have that day. Dependable and accurate! No other source has such accurate live wind reports. Very easy to use and the extended forecasting is very helpful. Check the wind and weather before you head out. Real time and accurate forecasts. This is a great app. 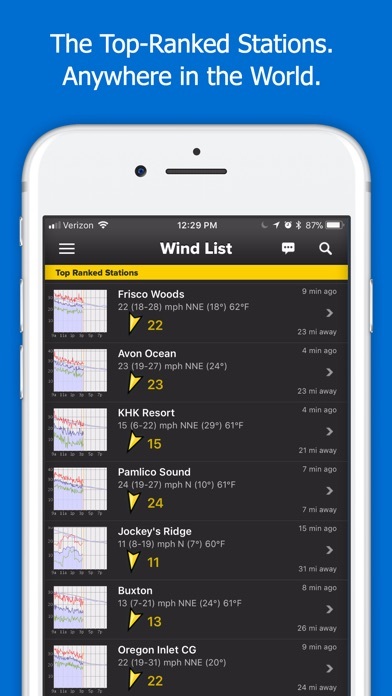 Up to the minute wind info and great long range forecasting - Great App! While traveling from Atlantic City to Cape Cod, SailFlow forecasted winds from favorable to increasingly on the nose. I diverted to Newport, had a pleasant 3day layover instead of nastiness at sea. I use the base version and it seems that over the last year many of the reporting stations that are used have disappeared. There are virtually no reports anymore for Nantucket and Hyannis areas. There used to be quite a few. Amazing, accurate and easy to understand graphics. Perfect for me. This weather / wind app is great for on the water & off. Without the help of SailFlow we would have to go back to using noaa. We feel very comfortable with this forecast. We have been able to leave the dock knowing that we can beat the weather, we used to think long and hard in the past. You have made our travels much more comfortable. I cannot live without Sailflow. 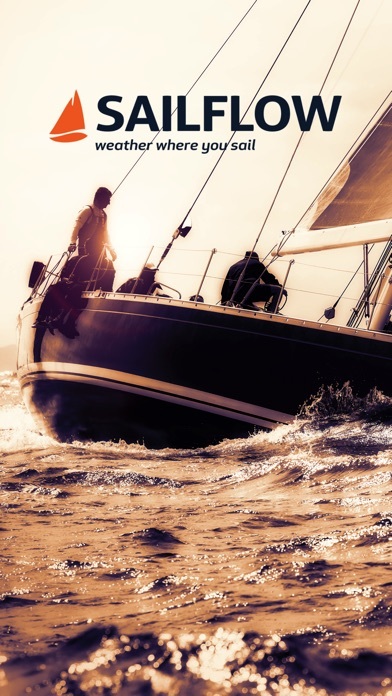 ...Don’t make yourself live without Sailflow! :) Also, the Wind List is an awesome new feature. Mandatory for sailors! First, after not using it for 6 months, it disappeared as an app from my phone. When I downloaded it from the cloud again, it only opens for 2 seconds, then disappears, reverting to the home screen. This happens each time I try to open it even after shutting the phone down and restarting. Deleted it and redownloaded-same thing. I don't want iOS 10 or 11 because I've got some old apps. It says it's supposed to work with 9 or higher. I always check SailFlow for the latest conditions, seems pretty spot on. Very useful app! I’ve never seen anything this good. Wish I had the Sailflow advantage in the 70s when I started racing sailboats! Love this app. There are so many weather markers accessed. There’s multiple stations on Galveston bay and numerous around Houston. I find their forecast fairly accurate. This is a very good tool for planing a sailing trip. You can get info on weather and tides for all points of your voyage. A must have app for all sailors. It’s my “go-to” app, thank you. The hourly wind and wave forecasts unpack the coming conditions beautifully. But of course these are only midpoints of model forecasts and they have uncertainty attached to them. It would be nice to either (1) know the model used, so a comparison to other models can be made, or (2) indicate some measure of the uncertainty of the forecasts. I work on the water in Monterey bay, and offshore as well As San Francisco Bay and I found this to be an out standing well put together format. It has been a huge asset to predicting the coming days weather. We use this site every week during the season. Almost always spot on! Thank you for covering Narragansett Bay!!! I live at the confluence of three navigable rivers in Washington state and have found this app excellent. Lots of excellent views and perspectives. I highly recommend it. If there was any criticism is the monthly price for premium features is a bit high. Whenever I am getting ready to go out on my boat, I checked SailFlow. I find it very helpful Although sometimes the wind seems to be different than what they forecast. Excellent way to know what the water is doing outside our marina. We use it every time we go boating. Constantly shuts down! So frustrating!! I have my captains license for over 35 years and this app is absolutely phenomenal. I use it for all my water activities and love its accuracy and excellent forecasting capabilities. A must waterman app. Crippled and useless UI resolution. I’m frustrated. Live wind, graphs and other data sets would be great to use, but they are completely unreadable on an iPhone. It is scaled for reading on a 24” Hi-Rez monitor or at least a very large iPad. You can’t zoom the data or change the font. Sailflow is going to the bottom of my app scrapheap until they can figure out how to port it properly to the iPhone. I sail on Lake Michigan and find your app to be very useful for both day sailing and racing.Chi-Mac,Queens Cup,Tri-state,etc. Sailing in Chicago, where the wind changes frequently, everyone uses this. Very convenient, gives me more sail time! I don’t go sailing without checking SailFlow. I run a sail school & charter business and rely on SailFlow, particularly for adventures to the Channel Islands and ones that last for a couple of days. Use it for sailboat racing and it is useful. Except for wind gusts, which are generally useless (seeing forecasts of 13mph with gusts to 30+mph is a little strange in our region (US Midwest) of the world. I pay for premium SailFlow yet I still have ads all over the screen. Why? I can’t press the play button on the radar due to these ads.